Stemming from the roots of Ayurveda, Aarshaveda strives to revive the long lost legacy! Settled by the banks of river Periyar, Aarshaveda is an initiative to bring back traditional forms of Ayurveda from where it had all begun. In 1945, renowned Ayurvedacharya (Qualified and experienced Ayurveda practitioner) K G K Panicker had set up an Ayurveda legacy that largely influenced the Ayurveda health care system across southern India, predominantly in Kerala. His growing passion to cure with the help of herbs and other medicinal Ayurveda alternatives had helped him build a chain of Ayurveda hospitals, Ayurveda pharmacies and Ayurveda therapy clinics within the states of Kerala, Karnataka, Tamil Nadu and Maharashtra. He was now a revered Ayurveda practitioner known to reform the way people approached the treatment of illnesses. 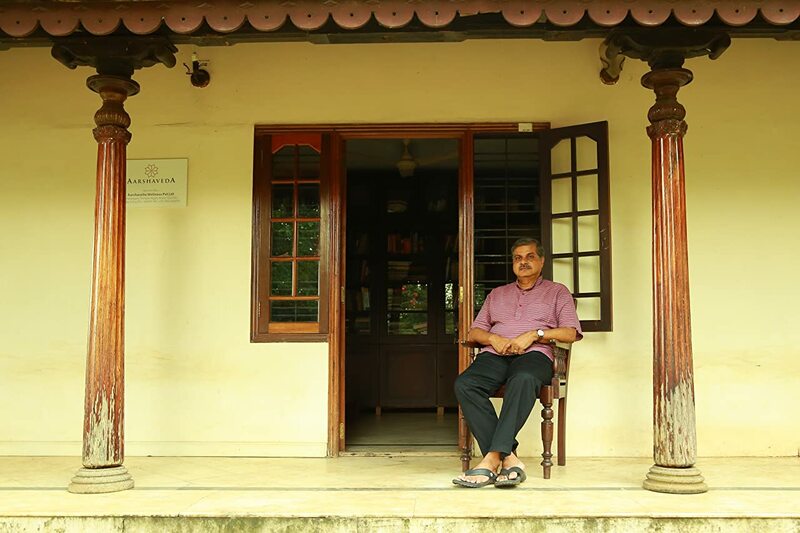 Born to inherit this lineage, KGK Panicker’s son Dr. Anil Kumar was brought up amidst this deep knowledge of Ayurveda. Early on, he had developed an interest towards learning the Ayurveda form of medicine and passionately studied the trends to modify and develop medicines based on specific patient needs. He actively continued to serve as an Ayurveda practitioner for his father up to the year 1973. Until, KGK Panicker’s unfortunate demise. The incident shook the entire family and Dr. Anil Kumar was soon expected to take over the business. But, he was no businessman. He was a simple, respected Ayurveda practitioner who had now devoted all his time to growing an empire set up by his father in the early 40’s. Upon building a few Ayurveda spas and resorts he understood the difficulties of sustaining a business at a humongous scale as what he had inherited. There were growing and repetitive overhead costs that caught on to him and any amount of spending needed to stop. Dr. Anil Kumar now also had a family of his own and therefore decided to proritise their needs. He soon succumbed to the pressure and the entire empire was taken over by a Venture Capitalist. But, the change of an era couldn’t separate him from what was rightfully his own. He wasn’t inclined to move away from what was built by his father. Dr Anil Kumar then decided to continue serving the Ayurveda brand, but this time as an employee. However, he continued to develop medicines for his family. Years went by and as destiny would have it, Dr. Anil Kumar’s son, Venkatesh Anilkumar had also grown with keen interest towards learning the Ayurveda form of medicine. As he entered adulthood, he was hired by the same company, the same Ayurveda lineage that was once built by his grandfather and owned by his father. He decided to work up the ladder to learn the aspects of doing business alongside developing medicine. The unique amalgamation of skill and economics was probably something he inherited from KGK Panicker. Something that money can’t buy and success can’t take over. After 8 long years of research and desperation to revive what was once lost, Venkatesh was struggling to find the time to start something of his own as an employee. The capital investment required today in 2017 was massive and Ayurveda was now a known form of medicine being practiced across India and around the world. His struggle continued until one day he had no choice. His new born had developed rashes that were really difficult to be treated. In an attempt to cure the rashes, Venkatesh along with his father started exploring Ayurvedic medicines available in the market. But, because his son had an extremely sensitive skin prone to infections he was particular about finding an oil made from Dashapushpam (medicinal flowers). While scouring the markets for the oil and failing to find it, he also realised how the practice of Ayurveda had become commercial and the lack of right information was depriving people of good medicine. At this point, Venkatesh decided to make the oil on his own with advice from his father. He was finally able to work out the authentic recipe of this oil for babies and tested it on his own new born son. The wondrous results of the oil on their baby planted the seed of Aarshaveda in Venkatesh’s mind. He knew he had to tell more people about this oil so he shared it with other family members, close friends and relatives. Like he had hoped, the oil was a success and absolutely free from side effects. Venkatesh finally decided to quit his decade old job at the company originally set up by his grandfather and aspired to establish a venture that sold specially curated Ayurveda products. As Venkatesh tried to set up Aarshaveda he knew he wanted to follow the same principles as his grandfather did 70 years ago. He wanted to source the organic roots and not use a cheaper alternative. Over a period of 6 months he was able to manufacture Dashapushpam oil for the baby, Dashapushpam oil for the mother and the Kumkumadi Face Oil in small numbers. With all the right kind of certifications in place he had expected the market to welcome these authentic healing oils. But, this time he was failed. The local shops and markets already had cheaper versions of healing oils and it became increasingly difficult to convince customers about the authenticity of the products. No matter how hard Venkatesh tried to focus around the premium quality of his products, he wasn’t able to make sales. The acceptance that the market had once shown to his grandfather’s products didn’t translate to Venkatesh’s products and it worried him. He knew he didn’t want to give up, so he decided to try out the online market. He knew Amazon was a global brand and therefore decided to set up his online store. ‘’The unique thing about online selling is that your customers aren’t local. If your products aren’t working locally, you can at least get feedback on your product quality from customers who probably live a thousand kilometers away’’ says Venkatesh. From a monthly revenue of 50 thousand, Aarshaveda now earns in lakhs. His sales grew twice as much during the big Diwali sale of 2017. He says, I don’t want to compete with anybody, not even with the brand that was once owned by my family. All I want to make is authentic Ayurveda products that made from completely natural and organic raw products and concentrate on what we do best as a family, heal people.